Orville was 50 and for four decades he simply ran for exercise. Until, finally, he entered his first race at the age of 90. DALLAS -- Orville Rogers never thought he’d make it to 100. Nor did he think, by the time he got there, he’d be this famous. Orville flew planes in World War II and Korea. After that, he spent most of his career as a pilot for Braniff Airways. It was during a layover in Chicago that Orville wanted to read the newspaper, but the airport bookstore was sold out. So instead, Orville bought a controversial book written by Dr. Kenneth Cooper. At the time, most people believed if you spent too much time running, it could kill you. In his book, Dr. Cooper suggested the opposite: Running was healthy. Once Orville read that, he was sold. “So I started running the next day and I’ve run a little over 42,500 miles,” he said. He won and has since set 18 world records for his age. 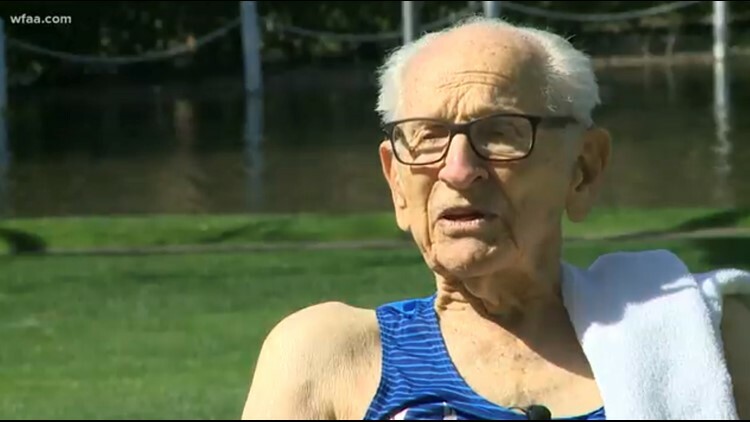 To this day, he’s still the only man over 90 to ever run a mile in less than 10 minutes. “The objective of people in my category is to slow down as slowly as possible,” he said. Indeed, his speed is fading, but the spotlight is not. Orville has written a book and was featured on ESPN for his heated rivalry with a 94-year-old speedster from Virginia. Orville won that race by five-hundredths of a second. He may not be very fast, but for anyone who feels too old to follow a dream, he is a trailblazer. One very slow step at a time.